I traveled to Vermont the day after Christmas. We have a houseful for the vacation so lots of cooking has been involved but also lots of great snow so the family is skiing and playing in the snow. And I am back to sewing. 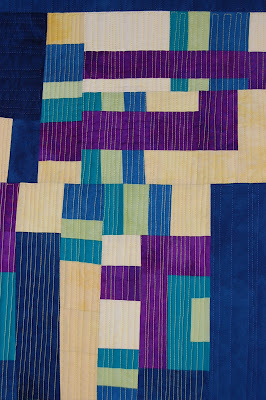 I started with working on my free motion quilting. 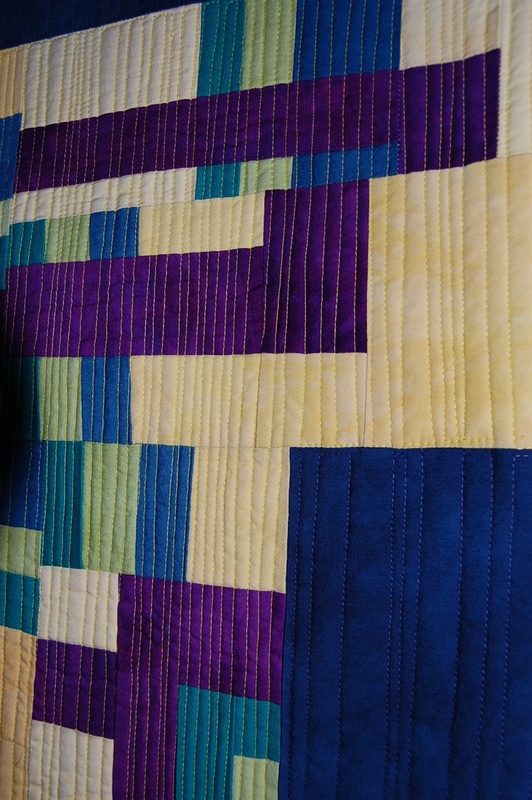 I really want to find a way to make the quilting aspect of it less tedious. So I will dedicate specific time over the next few months to work on it every time I am in the studio. I made a small bag out of this sample so I could document : the beginning. I also realized I would need a big design wall to work on the next project. 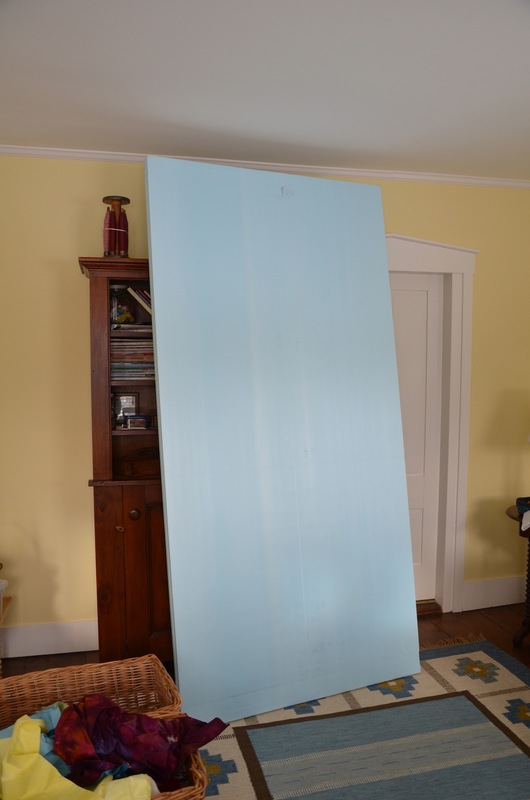 So, I took a trek to the hardware store and came home with a 2″x 4 ‘x 8’ piece of insulation. I covered it with flannel and am working on a Sets and Variables # 3 workshop piece. It hopefully will be pieced tomorrow. It’s been great to be back to sewing! 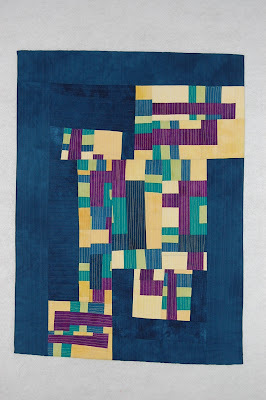 This entry was posted in machine quilting on December 30, 2012 by Colleen Kole. I had another great privilege this week via our local quilt guild, the West Michigan Quilt Guild. 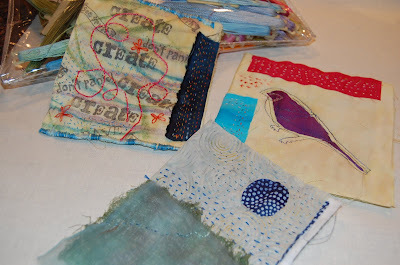 Every two months our guild brings in a teacher and this month was two days of classes by the wonderful Sue Nickels. 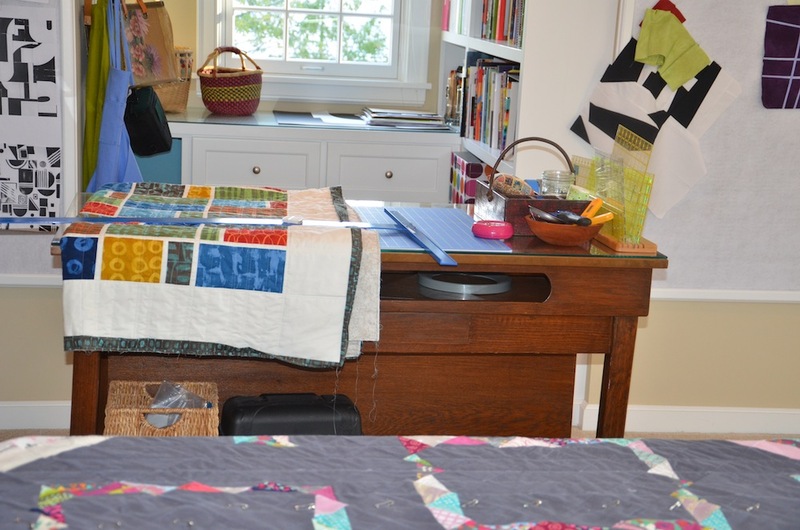 Sue is a traditional quilter and has been involved for over twenty years in teaching machine quilting. Her classes and lectures routinely sell out when she is at the national conventions. Two classes were offered: Machine Quilting Essentials and Machine Quilting Flower Basket Appliqué. 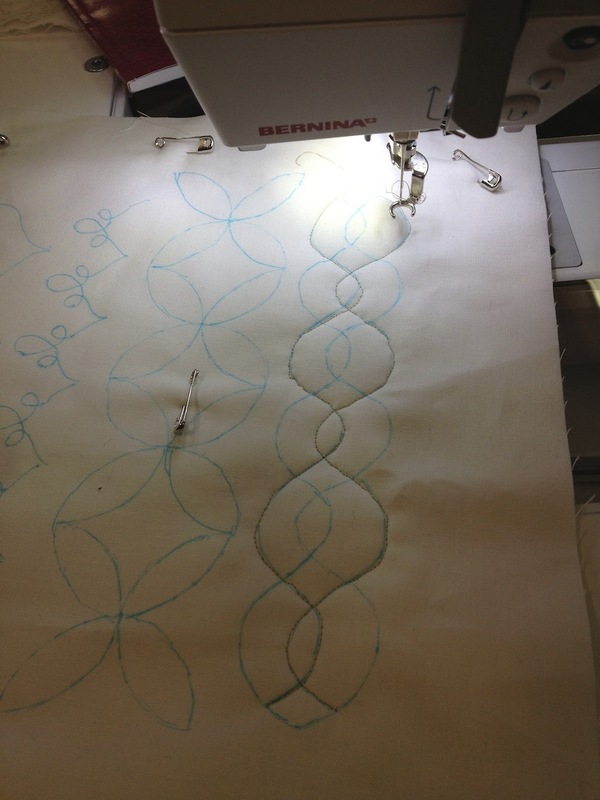 I took the machine quilting class since my next goal is improving my free motion quilting skills. Sue is thorough and very attentive to detail as is evidenced in her workmanship. It was nice to spend time with traditional quilters and a traditional teacher as their craftsmanship is so amazing. 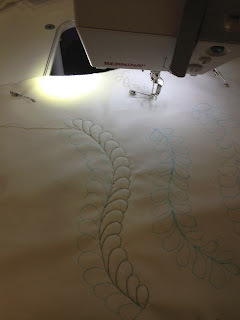 I have to say I was a little discouraged at the end of the machine quilting workshop(something else to work on…. :) and Sue immediately gave all of us a pep talk. 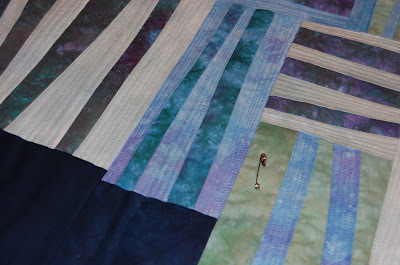 I think the biggest thing I took away is that machine quilting is a learned skill. I will take her advice on the the 3 P’s she coached us with : patience, perseverance and practice. I can’t imagine drawing a design and then quilting it, but you never know. I never plan that much when I quilt. 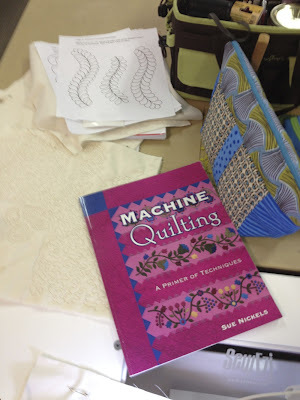 But I was very happy to gain a little knowledge in machine quilting and happy as can be with Sue as a teacher. If you ever have the opportunity, don’t hesitate to take her workshops! Wonder how many years I will need to work on this skill:). 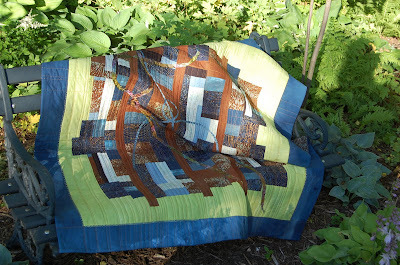 This entry was posted in machine quilting, workshops on November 30, 2012 by Colleen Kole. There is something rewarding about just pushing through and making it work even though you don’t like the initial design. I pushed even though the colors were not making me happy.The initial design was kind of cheesy. Well really just bad. In the end , I just needed to work through it and do it. 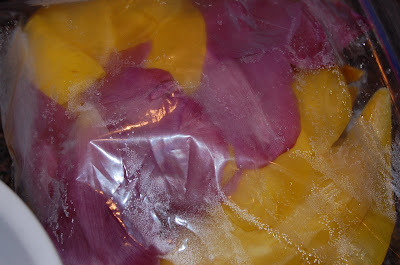 I didn’t like wasting my hand dyed fabrics. Hand dyed fabrics, machine stitched with yellow and blue cotton threads. I was having difficulty with my bobbin thread tension at first so I see two lines I might re-do. Quilt # 2 done and three is being basted today. 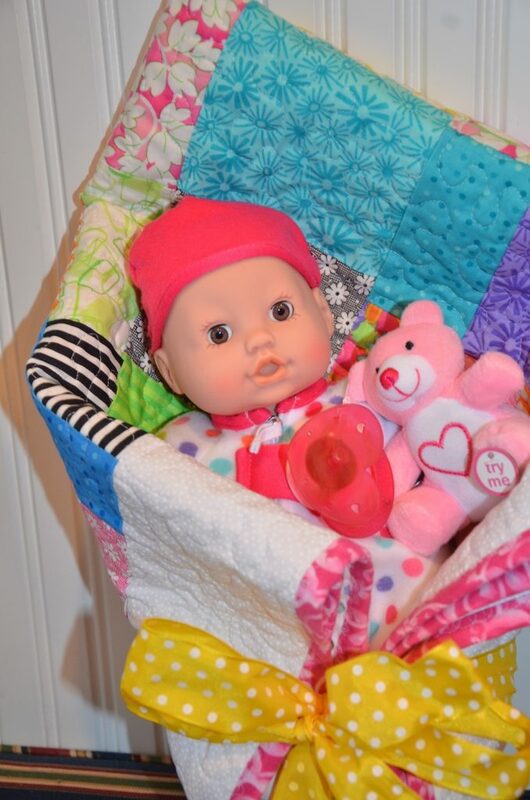 ( I finished a doll quilt too this weekend for the Santa Claus girls but that wasn’t on the list!) My son calculated I could only work on each top for five days to finish it -if I want to complete all 7 by the end of the year. 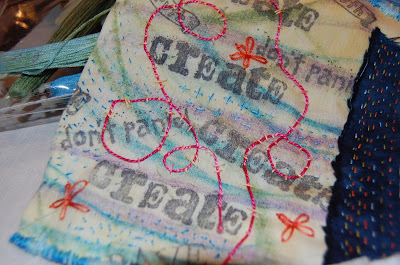 Giveaway: Post on last Friday’s post if you want to win the scissors and thread. I will pick tomorrow. This entry was posted in machine quilting, quilts 2010 on November 22, 2010 by Colleen Kole. I have an appointment. No-not to have my head examined. 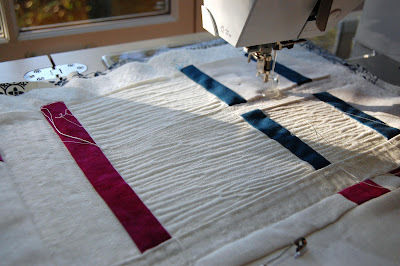 But with Leah Day of Day Style Designs who has put together an awesome amount of tutorials about free motion quilting. 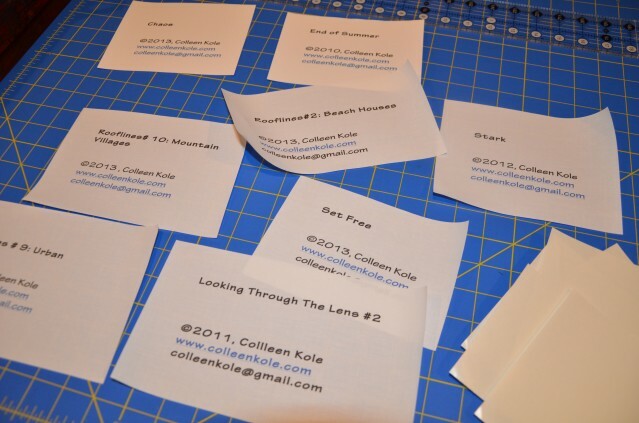 I have been spending maybe thirty minutes a day practicing some of these design on her blog. She is a great teacher and her tutorials found there are extremely helpful. And FREE. When I think of free motion quilting, I think of huge feathers or swirly things which don’t lend well with what I am currently doing. When I scanned her tutorials, she has many designs or suggestions that I could use. Already, I have found two things most helpful-to put a book by my foot pedal and to wear gloves-consistently. I didn’t like wearing them at first but feel they help me. I am tired of using my walking foot for machine quilting but never have been able to make free motion quilting “work” for me. I am always willing to try again. And I wanted a break from miserable design flops. It also works on a day when I know I don’t have the whole day to devote to piecing or design. Thirty minutes can be squeezed in anywhere, can’t it? This entry was posted in machine quilting on November 1, 2010 by Colleen Kole. I really missed watching the Olympics last night. 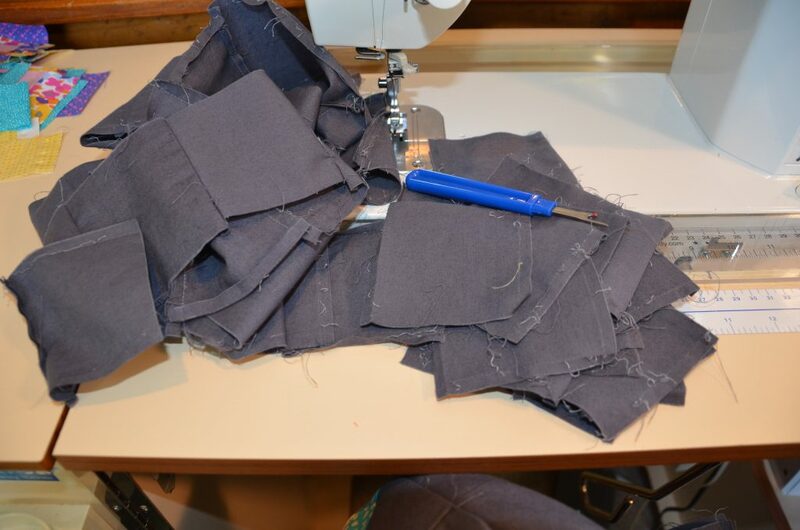 I would sit down with the kids and just do a little hand sewing each night. Just loved snuggling on the couch with the two kids and it was amazing how we all scattered so quickly last night finding other things to do. Have to think of something else. I have been trying to play catch up to my online class I have been taking with Melanie Testa at Joggles. We are making a small book which is filled with different techniques and stitches. Time-consuming but she is a great teacher and has plenty of notes to explain things. I need to figure out how to post these on their forum. Different from what I have been doing but fun to play. This was a piece of fabric I had stamped last month. Glad to use it for something fun like this. I also purchased this amazing resource that Robin Ferrier from Simply Robin suggested recently. 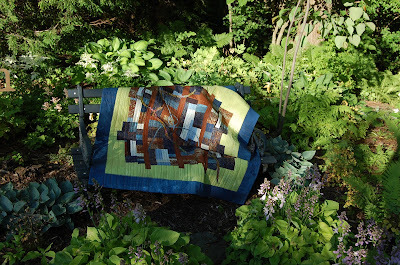 (She’s published this month in Art Quilting Studio magazine. Don’t forget to get your copy!) I, too, have been thinking of trying dyeing with natural products. But the processing with mordants seemed not worth the hassle. This book, EcoColour by Indie Flint does a great job of explaining natural dyes and is an great resource. I was so inspired that I rolled up a bit of onion skins, silk and sprayed it with vinegar and put it away in a bag for a month. I know, that’s a long time. Then, I froze some flowers-only had a bunch of light colored tulip leaves- squeezed them into warm water and placed them in another vinegar solution. (Daffodils are toxic-good list of toxic plants, too.) I didn’t used cotton but silk. 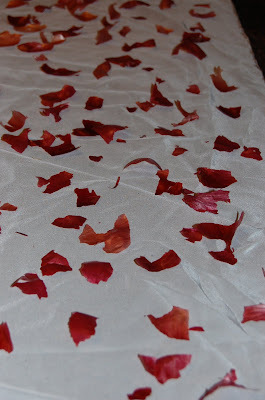 I chopped up a silk scarf blank that was put away. I’ll see what happens. I am sure, just as in using Procion Dyes, there is going to be a huge learning curve. I am all over the place this month , aren’t I? Sure did cure the winter blahs though. Now I have so many ideas in my little head that I can’t stop! 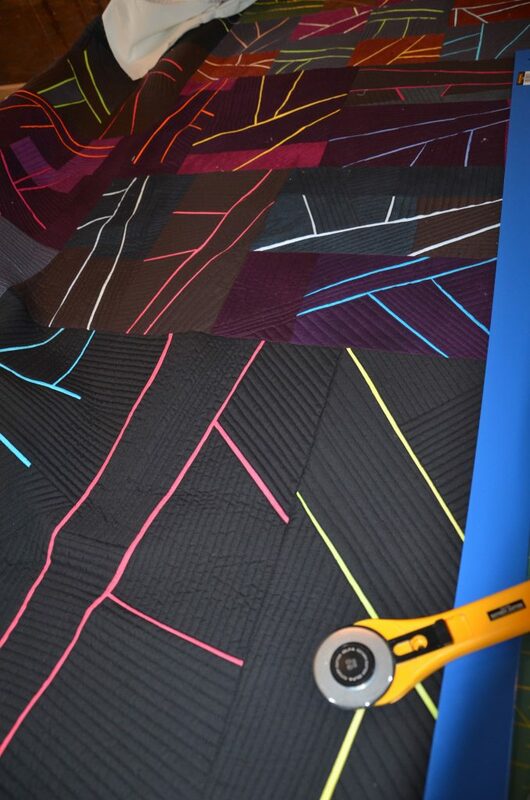 Working away on some machine quilting today. Happy sewing, my friends. This entry was posted in machine quilting, mark making class, natural dyeing, quilts 2010 on March 2, 2010 by Colleen Kole.